EJECUCIÓN DE TITULOS JUDICIALES Nº 127/2017 A INSTANCIA DE VANESA SAN SEGUNDO HERNANDEZ CONTRA LA CASONA FUSION S.L. EJECUCIÓN DE TITULOS JUDICIALES Nº 137/2017 A INSTANCIA DE FELIX ANGUAS GIL CONTRA LA CASONA FUSION S.L. PROCEDIMIENTO ORDINARIO Nº 520/2017 A INSTANCIA DE RICARDO HERNANDO GUTIERREZ CONTRA LA CASONA FUSION S.L. 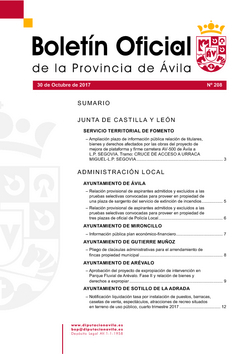 APROBACIÓN DEL PROYECTO DE EXPROPIACIÓN DE INTERVENCIÓN EN PARQUE FLUVIAL DE ARÉVALO.FASE II Y RELACIÓN DE BIENES Y DERECHOS A EXPROPIAR.